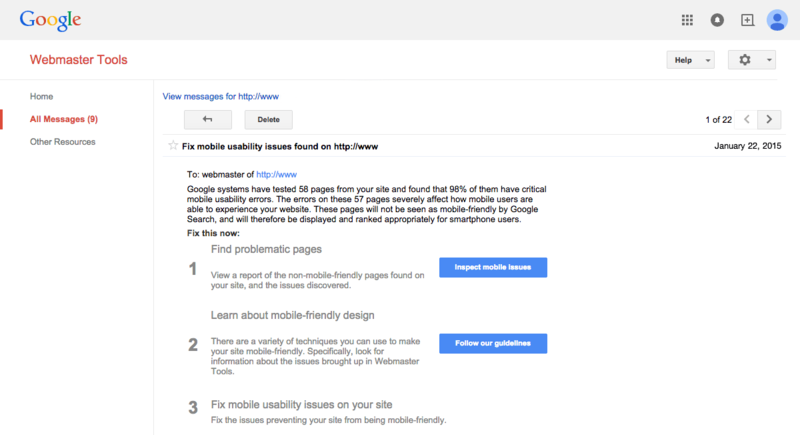 Google is in the process of sending out mass notifications via email and Webmaster Tools warning of usability errors for websites that are not mobile friendly, and these errors will cause issues for website that wish to rank well for smartphone users. The notification message with the subject “Fix mobile usability issues found on …” explains that these sites have critical mobile usability errors and that they will be “displayed and ranked appropriately for smartphone users.”. This comes at a time where a new mobile ranking algorithm is about to launch at Google and is part of a wider programme of improving the quality of its search results, with the search engine giant first announcing plans to address non-mobile friendly websites that back in June 2013. The message can be interpreted as a hint to forthcoming changes in the way Google presents mobile search results. This may mean sites that receive this message will have visibly reduced or, in the worst case scenario, lose visibility altogether, unless action has been taken to fix the issues. Take a note of how many pages Google is assessing and how many of these have been identified as having mobile usability errors. Look at what percentage of the website is likely to be impacted by the search algorithm update. Assess how much traffic could be lost if the worst comes to the worst and all organic mobile traffic to these pages is lost overnight. What percentage of your business will be lost if this happens? The figures produced from this piece of work should be all you need to convince others that immediate change is necessary. Once you have the figures and the case for remedy, see if you can get this issue ahead of all other development priorities. It is challenge enough if you have only got a few pages to optimise; if your entire site is poorly optimised for mobile users, then the task will be much greater. Time is not on your side and plans must be quickly put into motion to ensure the site is fully mobile optimised as quickly as possible.